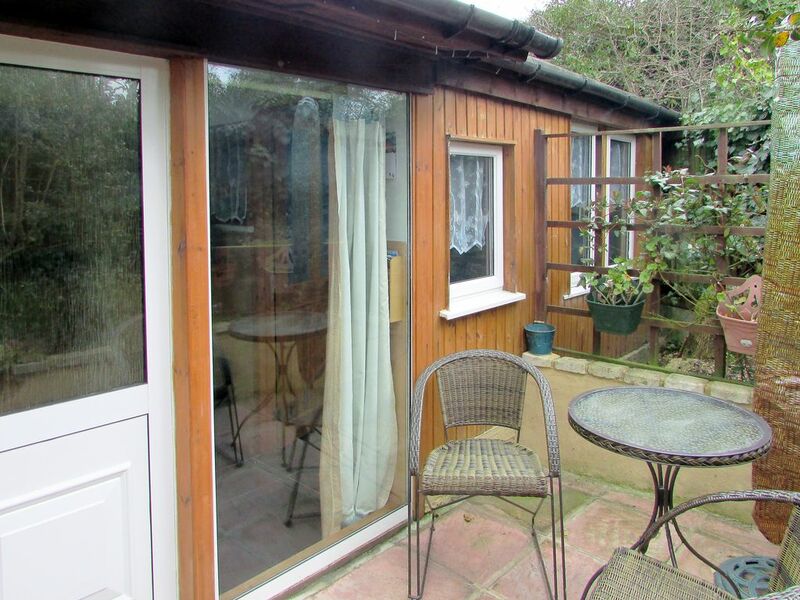 This small, single-storey holiday property adjoins the owner’s home. Cosy, compact and well-equipped, it provides everything you need to enjoy your holiday. The open-plan kitchen comprises a full-size oven with hob, microwave, fridge, freezer and washing machine; the dining table is also located in the kitchen area. Partitioned off from the open-plan layout is the bedroom with a double bed, TV, wardrobe and chest of drawers. Guests can enjoy privacy on the small patio area with seating, which is also enclosed for pets. There is a small shower room with tiled flooring, toilet and basin. Central heating to the property is included and controlled from the owner’s property - electric heaters are also provided in the open-plan kitchen, along with an electric coal-effect fire in the conservatory area. Internet connection is available and guests are more than welcome to bring pets. Guests can store cycles, surf boards, wellies etc in the garage, which hosts the entrance to Squirrels Leap. Parking is also available at the front of the property for one medium-size car. The beach at Tankerton is within a 20-minute walk. Whitstable is a bustling harbour town, famous for its oyster festivals, and there is plenty to do and see. Take a walk along the beach, or enjoy dinner in one of the many restaurants, or a drink in the seaside pubs. Canterbury is a short drive from Squirrels Leap - here you can visit one of the most famous cities in the UK and explore its city walls, the cathedral, or even take a boat tour through it. Fishing is available at Mansfield Farm Lake at Broad Oak, which is a 15-minute drive, approximately 6 miles away, and a day ticket is £8. Local road maps and information leaflets are all available at the property to help guests decide on the best ways to fill their holiday. Beach 1½ miles. Shop, pub and restaurant ¾ mile. Kitchen/dining room: With electric cooker, microwave, fridge, freezer, washing machine and partitioned area with double bed. Conservatory area: With electric coal-effect fire. Partial gas central heating (controlled by owner), electric heaters, electricity, bed linen, towels and internet connection included. Small enclosed patio area with garden furniture. Pond area with garden furniture. Bike store. Private parking for 1 car. No smoking. Please note: No children under 18 years old. Access to the property is through the owner’s garage, and there is a pond in the garden. This studio adjoining the owners' home, does not have a separate bedroom. There is a pond area with seating, care to be taken. The property offers Wi-Fi via a router in owners house next door. No children under 18 years. Dogs only - no other pets allowed.